Built by TK McDonald in 1897, this house and its bathing sheds have been in the same family since 1915.The house was used as a Home Guard base during WW11 when Porirua Harbour was considered a possible site for an enemy invasion. Exnell House C1912 is the first large darker coloured building with light roof in background. Following the first subdivision of Plimmerton in the 1986 Plimmerton, Lot 33, 2 Bath Street was purchased by Mrs Francis Rossiter MacDonald, wife of the Auctioneer. Mrs MacDonald had the Bungalow Nikko built and advertised it for rent in The Evening Post from 1898 to 1904. She purchased the beach front section in 1908. PCC Culture and Heritage describe the house as being two storeys tall at the back and a single storey at Steyne Avenue, and roughly square in plan. It has a shallow-pitched hipped roof and enclosing verandahs on three sides accommodated within the slope of the roof giving it a distinct “colonial” appearance. It is clad in broad weatherboards and finished with tall double-hung windows( now doors). Outbuildings include an old single garage on Bath Street and a former bathing shed with a distinctive cruciform shape which sits on the back section. Mrs MacDonald described the Bungalow Nikko as a charming, 8 rooms, large sitting room with piano, kitchen, every convenience, detached washhouse with copper and tubs, bathing houses and nice garden. It was offered to a good tenant for 27s 6d per week. The property has many mature trees (including pohutukawa) and a rare (for the area) lawn fronting the beach. On the Beach frontage there is a rough concrete sea-wall. Both sections were sold to Alice Coombs in 1914. She renamed the house Exnells, a name that links back to her Hertfordshire roots where Exnells farm is 5 miles from Birchanger, the name Alice called her property in Palmerston North. Clearly these places are both significant to the Coombs as Alice named her Aotearoa house after them. In another link to its history, Exnells is situated in the Tauranga Waka area of the beach near where Te Rauparaha’s kainga was, near South Beach Road. Exnells current owners whakapapa to Ngāti Raukawa and link through marriage to Te Rauparaha. Alice Coombs daughter, Alice Elizabeth married James Mottershead ( Ottie ) Collins who was great great grandson of Te Akau, senior wife of Hapekituarangi. On his death Te Akau married Te Rauparaha and accompanied him to Kapiti. After their 1914 marriage Ottie Collins and Alice eventually settled in Hawera and Exnells continued its role as a summer attraction, the family beach house. Rambling walks, boating, swimming and tennis were favourite pastimes and Ottie Collins was instrumental in setting up the Plimmerton Tennis Club. 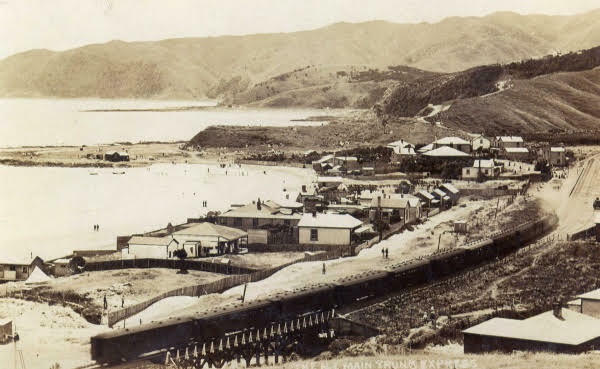 Ottie died in 1928 and Alice and the Hawera Collins’s continued to go to Plimmerton and spend idyllic days for the especially for the children who spent long afternoons on the beach, playing rounders and building sand boats for the tide to wash away. In 1981 Exnells was bought from the Coombs Estate and is still owned by descendants of Alice and Ottie Collins. Included in this group was the late Crenold (Cren) Collins, well known Plimmerton resident, PRA and Croquet Club member. Among many memorable events at Exnells were the Bath Street Festival of 1986, Morris dancers included and an infamous large and noisy party just before the 1981 Springboks Tour in 1981 where on Steyne Avenue Police presented long batons to the public for the first time. Today Exnells remains a summer house to the whanua as it always has been. Large Christmas gatherings are a regular event with many visitors sleeping over in tents on the lawn. The house is remarkably original by modern standards with most items mentioned in Mrs McDonalds rental advertisement in 1898 still remaining, including the bathing house, garage, detached wash house and the piano. The convenience of an inside bathroom was only added in 1995. Exnells has been in the same family since 1915 dating back to Alice Coombs. There are now many family shareholders all of whom hold a stake in its heritage, history and also its future. Exnells was be 120 years old in 2017. Site 27 What’s wrong with dynamo torches?